Axes and gradients of the neural tube and gradients for a morphological and molecular genetic classification of nervous system malformations. Holoprosencephaly. Septo-optic-pituitary dysplasia. Rhombencephalosynapsis. Embryology and malformations of the forebrain commissures. Disorders of segmentation of the neural tube: Chiari malformations. Segmentation of the neural tube: agenesis of selective neuromeres. Cerebellar hypoplasias. organization of the head and neck: Part II. The oral-facial-digital syndromes. Congential vascular malformations in childhood. Acquired, induced and secondary malformations of the developing central nervous system. Epilepsy in patients with cerebral malformations. Neuromuscular disorders associated with cerebral malformations. Neuroendocrine complications of central nervous system malformations. Cerebral dysgeneses associated with chromosomal disorders. Cerebral dysgeneses secondary to metabolic diseases in fetal life. Imaging malformations of cortical development. Clinical neurophysiology of cortical malformations: magnetoencephalography and electroencephalography. Molecular genetic testing and genetic counselling. Embryology and neuropathological examination of central nervous system malformations. Medical treatment in children with central nervous system malformations. Surgical treatment of central nervous system malformations. Neurorehabilitation of children with cerebral palsy. Educational, cognitive, behavioral and language development issues. This volume deals with brain development malformations of the central nervous system, showcasing a unique approach that furthers research through systematic integration of exciting new developments from fields including molecular genetics, neuroimaging, and neuropathology. By integrating data and research from these disciplines, better conceptualization of the mechanisms of the developmental processes is achieved. Clinicians will find invaluable insights into complex issues, including midline hypoplasias, disorders of segmentation of the neural tube, and hamartomatous disorders of cellular lineage, amongst others. 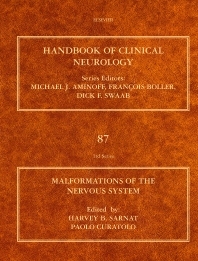 The clinical manifestations of central nervous system malformations are also discussed, along with new advancements in MRI techniques and analysis, including volumetric morphology, spectroscopy, and functional neuroimaging. Sections dedicated to management and treatment are also included in an effort to aid clinicians in their goal of providing better care for individuals affected by these types of malformations.